The Christmas tree and all the decorations are already up at the FYH ranch. Thanks to a late Thanksgiving night Seal Team like Black Friday Raid, we have about 80 percent of the shopping done. I like this kind of season, because it lets me relax, and enjoy Christmas. Ahead we still have tickets to the Atlanta Ballet’s Nutcracker, and a trip to see the lights at Callaway Gardens. But we can just enjoy. My wife and I started an interesting tradition about 4 years ago. When you’ve been married as long as we have, it’s sometimes hard to think of inventive presents for each other. That year, we weren’t really sure if we could afford to spend much. We don’t go into debt for Christmas. But I got a couple of commissions paid early, and on the morning of Christmas Eve, my wife surprised me. We were out driving ostensibly to pick up a Honey Baked Ham, and she pulled into the parking lot before the ham place. The only interesting store in that place was a big box sporting goods store. I looked at her with a grin. 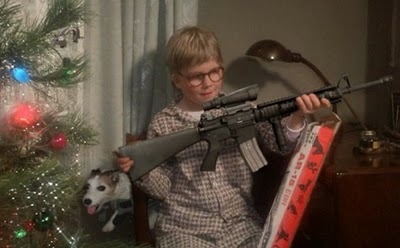 I felt like Ralphie. I had wanted a 10/22 for a couple of years, but I’d put it off for some reason or another. Next, we drove to her favorite shop, and she got to pick out some comparable gifts. Every year since then, we’ve gone out on Christmas Eve, and enjoyed ourselves as the other picks some gift that’s meaningful, and oftentimes longed for. It’s every bit as enjoyable for me to experience my wife’s interest and expectation, as it is to open those presents on Christmas. This year? I’ve got my eye on a Dillon 550 loading press. That cold steel beauty . . .
On Christmas Eve, we’ll see.